RV Tire Safety: Why do tires fail? There are basically two reasons that explain the vast majority of tire failures. 1. Over-load / under-inflation which are almost the same thing since it is the inflation air that carries the load not the tire. Under-inflation: A tire operating at less than 80% of the inflation needed to carry the load, is considered to have been run flat and there is a good chance that there has been permanent internal structural done to the tire if driven on in that condition. Related to this is having the tire inflated to a level that just barely is rated for the actual load on the tire. Obviously you can be under-inflated because of cut or puncture or a valve leak or if you use an inaccurate gauge. If you run sufficiently low in pressure at highway speeds for a just a few miles you can have a Run Low Flex Failure or more commonly a "Blowout". Steel body tires can have "Zipper" failures due to fatigue of the steel body ply. Over-loaded: Few people realize that by design, most passenger vehicles have 13% to 20% or more "Reserve Load". That means that they are actually under-loaded by that much for a vast majority of the time. Most RV trailers on the other hand have tires selected that are at the tire max load and can just barely carry the actual load while motorhomes seem to have some reserve load but not as much as passenger cars. Data on actual loads measured shows that over half of RVs measured (out of many thousands) have one or more tires overloaded based on actual inspection. 2. Heat. Heat damage occurs at the molecular level and degrade the ability of rubber to flex and stretch and not break the chemical bonds. Once cracks form the rubber does not repair itself, the cracks just continue to grow. If they grow enough eventually you may have components come apart. Heat comes from a few different sources. This heat is generated by the flexing of the tire with the hottest region being at the belt edges (edge of the tread) in radials, not the sidewall if the tire is properly loaded and inflated. Increased speed generates more heat. Sometimes the heat is generated faster than it can be transferred to the surrounding air. Over-loading generates more heat. Under-inflation generates more heat. Having 0% reserve load generates more heat than having 10% reserve load which generates more heat than being 15% under-loaded etc. This heat can soak into the structure of the tire and actually accelerate the aging of the rubber in the tire. As rubber ages, it looses it's flexibility so this contributes to the breakdown of the rubber at the molecular level mentioned above. Part of Organic Chemistry is chemical reaction rate. For every 18F increase in temperature the rate of aging doubles. Heat also comes from being in the sun when parked. So if the RV is parked with tires in direct sunlight you can see the tire achieve 36F increase or more which means it is aging at more than four times the rate it would have if in full shade. If you want to understand the technology behind this accelerated aging due to heat I suggest you can read some of these sources if you have a few hours. I provided temperature data in my post on white tire covers which protect tires almost completely from this heat damage. Many times the cumulative damage from excess heat can result in a separation of the belts and tread from the rest of the tire. Remember aging of rubber makes it less able to tolerate flexing. Hope this helps others understand the causes of the vast majority of tire failures. Not sure what you mean by "tire core" but if any coed is visible on the inside the tire is scrap. Is the tire store a small independent shop? I would contact the tire manufacturer and provide photos of the tire damage. Also ask for something in writing from the tire stor owner stating there is nothing wrong with the tire. Have him sign the statement and write it on the back of the photo. I had purchased white tire covers for our RV equipped with 275R70/22.5 tires and continue to use them but in the meantime read an article somewhere (?) that black covers are actually more protective than the white. Any thoughts? I know about that post. Clearly the person writing that item doesn't understand the affects of heat on rubber. I am conducting tests right now to develop hard data but still stand behind my article that white covers are best. Wow! Thanks so much for this free and super valuable information. Your wisdom might have been worth at least a six pack to that fellow camper. 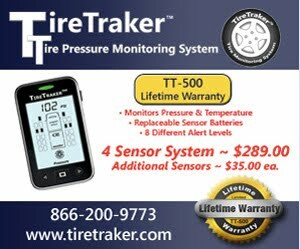 TPMS Accuracy & I had an air leak!